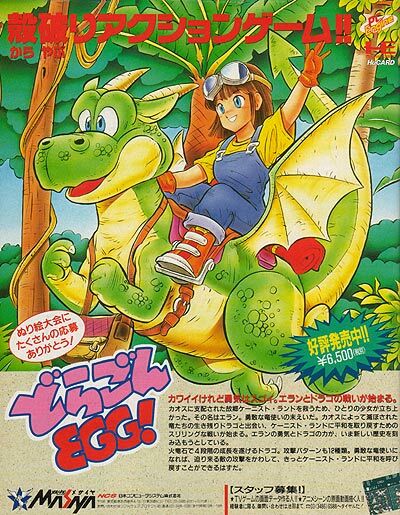 A girl and her egg, all alone in the cruel world. 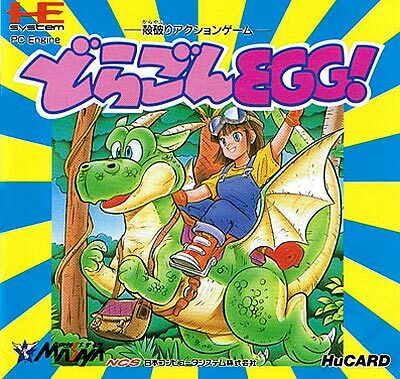 But this is not just an ordinary egg, collect or buy power-ups (from handy local stores) and out pops a little dragon's head, ready to swing round and breathe fire at anything that dares to get in your way. 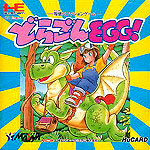 Collect enough of them and the dragon hatches fully, allowing you to ride on its back, spraying enemies with fire balls. All this is done over scenery ranging from woodlands to strangely un-fantasy like hi-tech fortresses. SOUND TEST: On the title screen push: UP, UP, DOWN, DOWN, LEFT, RIGHT, LEFT, RIGHT, II, I. LEVEL SELECT: On the title screen push: DOWN, DOWN, UP, UP, LEFT, RIGHT, LEFT, RIGHT, II, I.